A visual impact to really wow your guests! 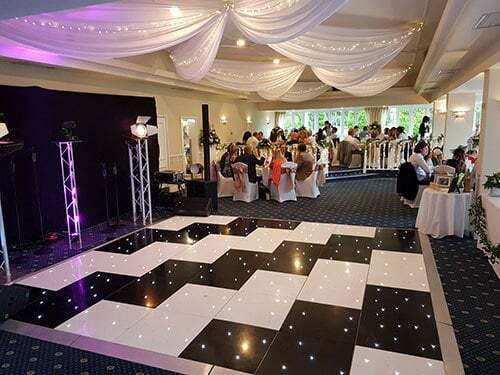 DJ2K can provide white or black starlit dance floors of all sizes across London and Surrey. All our dance floors are owned, maintained and installed by ourselves, we clean and polish them before and after each event to make sure they look fantastic for every client. They are manufactured in Britain which ensures absolute quality, safety and reliability. Key features include high load baring capabilities, slip resistant acrylic surface, while our special locking system ensures that panels cannot come loose or form high heel catching gaps. Why book a starlit dance floor? The chances are your venue will have a well used wooden dance floor, something that will suffice but certainly won’t leave a lasting impression on your guests or create a attractive focal point. For an additional cost we can place one of our illuminated poseur tables on each corner of the dance floor which will provide your guests with somewhere to put their drinks whilst dancing, this will help to avoid broken glass or drinks getting spilt on the dance floor. 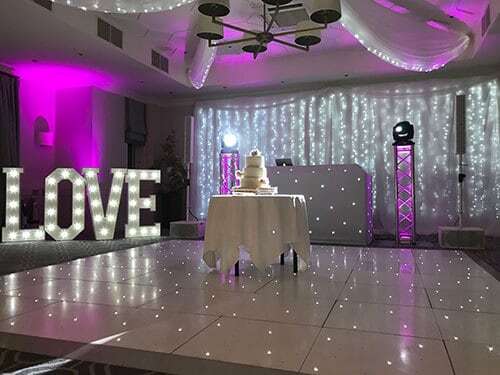 Many of our clients add a giant illuminated LOVE or Mr and Mrs sign to complement the dance floor. We can also match our DJ Booths which are starlit and available in black or white to create a seamless and stylish look. With the addition of our dry ice machine you can turn dancing on the stars to dancing on the clouds for a magical first dance moment, and why even stop there – why not hire one of our confetti cannons to fire silver and/or gold confetti as soon as your first dance is complete. The speed and brightness in which our starlit dance floors twinkle and sparkle can be set using a dedicate wireless remote. We have six settings to choose from including all on and all off. 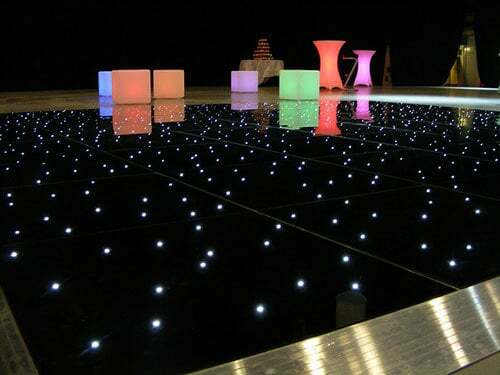 Our fully trained and uniformed staff will deliver, install and collect the starlit dance floor after your event so rest assured you are in great hands. We ask our clients to allow 45 minutes for installation and cleaning, allowing it to be installed even in the most time restricted room turnaround period. Each starlit panel is 4ft x 2ft which creates extra strength, you may notice by close inspection that it is laid in a brick like formation. 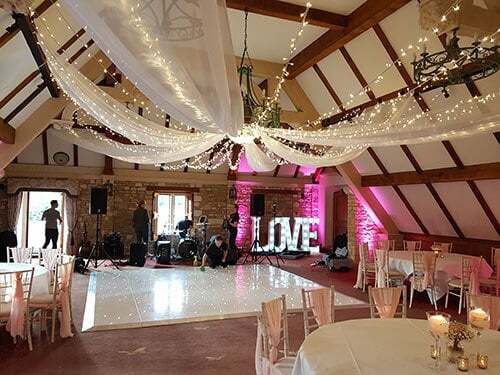 We can lay square or rectangle shaped dance floors as well as create a aisle at your wedding reception for those couples wanting to make a extra special impression. Our dance floor hire London and Surrey prices start from as little as just £499, price is size and season relevant. To book or find out more about our white or black starlit dance floor hire service, please don’t hesitate to call us or alternatively fill out the form below.